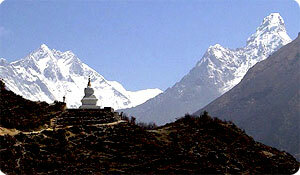 Everest trekking is popular trekking routes in Nepal. Everest trekking is known as Everest hiking to explore Mt. Everest base camp trekking trails & superb views of Mt. Everest region. Everest region trekking is not only popular for top of the world Mt. Everest but a but Everest region trekking has extensive Himalaya glaciers, magnificent mountains, windswept forests, animals, birds, and monasteries and is the home of the world famous Sherpa people, flora and fauna as well as existence of the yeti remains Everest trekking trails become popular trekking trail in Nepal Himalaya. The Everest Region is within Sagamartha National Park established in 1976 , lies on 120 kms North East of Kathmandu valley and covers an area of 1,148 sq. kms of the Himalayan ecological zone. Mt. Everest at 8848 meters (29,028ft) the highest mountain in the world, which is known in Nepal as "Sagarmatha" the goddess mother of the world, has l been the greatest attraction for nature lovers trekkers ,Mountaineers equally. Everest region trekking offers various trekking trail in Everest region including Everest base camp trekking , Jiri to Everest base camp trekking , Lukla Everest base camp trekking, Gokyo trekking, Gokyo Cho la pass trekking, Gokyo Cho la pass Everest base camp trekking, Gokyo Renjo la pass trekking, Everest high pass trekking, Everest view trekking, Everest comfort trekking, Mera peak climbing and Amphu lapcha pass trekking, Everest base camp and kala pattar trekking, Everest panorama trekking, Dudh kunda trekking, Pikey peak Everest base camp trekking etc. As above trekking trail in Everest trekking route in Everest region Everest base camp trekking, Gokyo ri trekking, Gokyo Everest base camp trekking and gokyo Renjo la pass trekking is more popular trekking destination in Everest region trek. For all above trekking can be done through kathmadu by bus to Jiri or Kathmandu by flight to lukla for trekking in Everest region. Himalaya Journey Treks & Expedition operate Everest Himalaya trekking according to clients holiday schedule and wish. Since Everest trekking trail has been open Himalaya Journey Treks & Expedition professional trekking operator (R.P) has depth experience to arrange the Everest trekking tour as private or group join basis, individual or groups, family or relatives, collage or club groups in tea house or camping / tented trekking with fit all age groups trekkers/ mountaineers. Sagarmatha national park permit is required for Everest region trekking which you can obtain through government registered Nepal trekking agencies. Some of the trekking in Everest region has challenging trekking trail for adventure trekkers which trekkers/ travelers can accomplish by Himalaya Journey Trekking and expedition according to clients attention turn their dream into the reality with life time Experience in Himalaya!